This entry was posted on October 21, 2015 by Texas Safety Supply. Industrial workers working in factories have to deal with harmful chemicals and gasses on a regular basis. Any health problem caused by daily exposure to these elements can create mistrust and fear in the minds of your workers. As a business owner, ensuring their respiratory protection is your primary concern. The 3m8210V n95 respirators have been created to ensure that industrial workers. It is lightweight and disposable and comes with some interesting features, keeping the user’s comfort in mind. 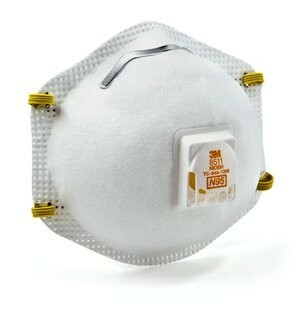 The respirator includes 3M’s proprietary technology with the latest electrostatically charged microfiber filter media. The exhalation valve of 3m8210 n95 respirators minimize the buildup of heat within the respirator, thereby ensuring comfortable breathing to the wearer. The secure seal minimizes the risks related to eyewear fogging. The adjustable nose clip and cushioning nose foam ensures that the respirator fits the wearer suitably. Moreover, the respirator is compatible with different types of protective eyewear and hearing equipment. It is suitable for grinding, sanding, bagging, swapping and all other types of dusty operations. Long term durability is ensured by its two strap design and stapled two point attachment. 3m8210 Respirators can be used to minimize the inhalation of different types of airborne biological particles such as mycobacterium, tuberculosis, and mold. The 3m 8210 Respirator is suitable for use in emergency preparedness planning. However, they need to be used with caution as misuse can cause serious illness or death. So, your workers need to read and understand the proper use and application of 3M N95 Respirators. These disposable respirators are suitable for use in places with dusty, hot work settings. 3M particulate respirators are NIOSH approved and have 95% filtration efficiency against liquid and solid aerosols which do not contain oil. For selecting the correct respirator and its appropriate use, users should first consult with the 3M Respirator Selection Guide. Use of these respirators will keep your employees safe from airborne particulates. The 3m 8511 n95 respirators are approved by NIOSH and have 95 percent filtration efficiency from specific non oil based particles. Heat buildup within the respirator is ensured by the 3M Cool Flow Exhalation Valve. These respirators come with adjustable M-nose clip which minimizes the chances of eyewear fogging. Their advanced electret media design ensures comfortable breathing. Once your employees become adept in using these respirators, chances of accidents within your factory will go down. Their efficiency and productivity will also go up as a result.